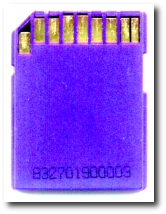 *) Specifications: The USB flashdisk should have a capacity of at least 8 GB. SD cards and other flash media can be installed, too. Flashing takes about 10 to 20 minutes for the full DVD size, depending on the supported writing speed. 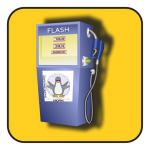 If desired, flash media will be ereased and re-partitioned with a writable overlay, when being filled with KNOPPIX data. Therefore, we cannot provide any warranty against data loss of any kind, or even media defects! Please label your flashdisks accordingly, so they won't get lost. Most modern computers support booting from USB flashdisk or cardreaders today. Sometimes, keyboard combinations have to be pressed during start, in order to get a boot menu, like F8, F12 or Escape. In order to create a bootable USB-medium (memory flashdisk, SD-card, digital camera with USB connector, cellphone with microSD, ...), the program flash-knoppix can be started from a running Knoppix DVD system. This program installs all needed Knoppix files onto the FAT-formatted flashdisk, and creates a boot record for it. After having copied the system to flash, using the persistent Knoppix image or partition (overlay feature), it is possible to also store files permanently in live mode. That way, personal settings and additionally installed programs survive a reboot.